Every time Apple releases a new version of iOS, those not lucky enough to be using the latest and greatest devices that Apple has to offer find themselves struggling with the exact same question – should they update to the newly released version of iOS, or stick with what they already have installed? That kind of question is difficult to answer because it has many facets. Does the user want to jailbreak, for example, or are they simply trying to get as much performance out of their older hardware as possible? Some of Apple’s iOS updates have, unfortunately, done the opposite, taking existing hardware and making it slower when completing some tasks following a software update. That’s left many, understandably, wary. 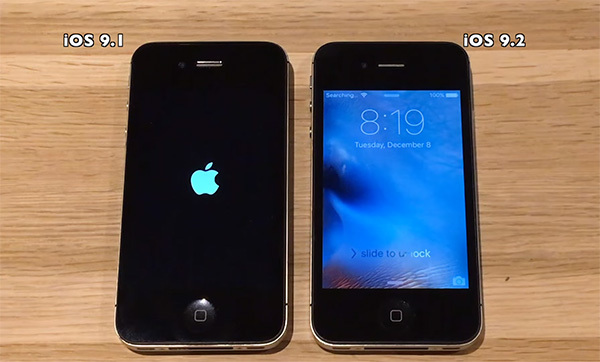 In order to answer the question of whether users running older versions of Apple’s hardware should update to iOS 9.2, the following head-to-head speed test videos pit iOS 9.2 against iOS 9.1 on some older iPhones and then compares their performance. iPhones tested include the iPhone 4s, 5, 5s and 6. The results? Well, it all depends on what you want. As the video shows, iOS 9.2 proves itself to be the best version of iOS 9 to date, but if you’re looking to jailbreak and are currently running a version of iOS (9.0-9.0.2) that caters for that, you’re going to want to hang fire for now – iOS 9.2 isn’t currently jailbreakable, so there’s definitely that to keep in mind! Apple’s ability to keep older hardware ticking along nicely has been one of the plus points for iPhones and iPads since their introduction. With iOS 9.2, that shows no sign of changing. Yes, recent releases have caused decreased performance on older hardware, but iOS 9.2 seems to be bringing a modicum of stability back to the update cycle. Check all the videos out for yourself to get a feel for the kind of speeds you can expect from iOS 9.2 on a range of devices.